Cyclocross bikes are designed for versatile terrain. When purchasing one, the correct fit is imperative. 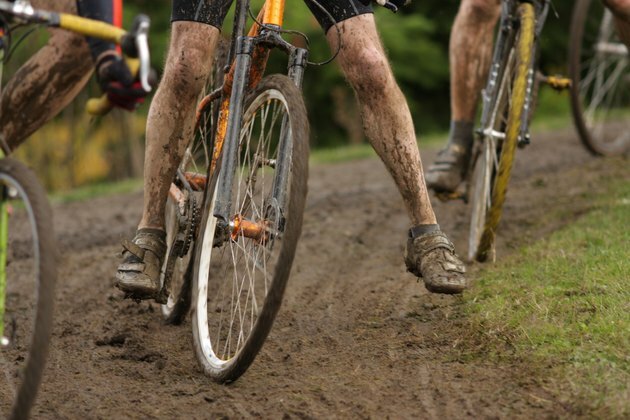 An ill-fitting cyclocross bike is uncomfortable and can cause back pain. When sizing a cyclocross bike, the two things to consider are frame size and saddle height. The frame is the primary component of the bike and the saddle refers to the seat. A proper frame allows you to stretch your legs out so that you can pedal, while the proper saddle height allows you to stretch out and reach the handlebars comfortably. Cyclocross frames are measured center to top, referring to the length of the seat tube. You can use a common formula with your inseam measurement to size your bike properly. Stand straight with your back against a wall. Have someone take your inseam measurement by measuring the distance from your heel to your crotch. Convert the measurement to centimeters by multiplying the inches by 2.54. Multiply your inseam length in centimeters by .67 to get the frame size. The proper frame size allows for natural knee extension. For example, if your inseam is 32 inches, the proper frame size is 55 centimeters. While the formula is typically accurate to within a few centimeters, it's a good idea to stand over the bike with your feet on the ground to make sure the frame size fits. A person with a 32-inch inseam may feel comfortable with a slightly larger frame, such as a 56-centimeter frame. Multiply your inseam length in centimeters by .883 to get your saddle height. The correct saddle height allows you to stretch your body out comfortably. Unlike your frame, you can adjust your saddle height at any time by merely loosening the nuts and raising or lowering the seat. If you ride with your toes down and your heels raised, you may find that you need to adjust your saddle so that it is slightly higher to match your riding style.